Countryside views, Playground, Walking distance to tavern, Close to the beach! Kampos Villa ΙΙI, is one of the three autonomous villas nestled in the countryside village Achlades, near Panormos . This unique Villa, is brand new & built with care, unique design and modern amenities! It’s light, very sunny and airy…in little words, an ideal Villa for your holidays! 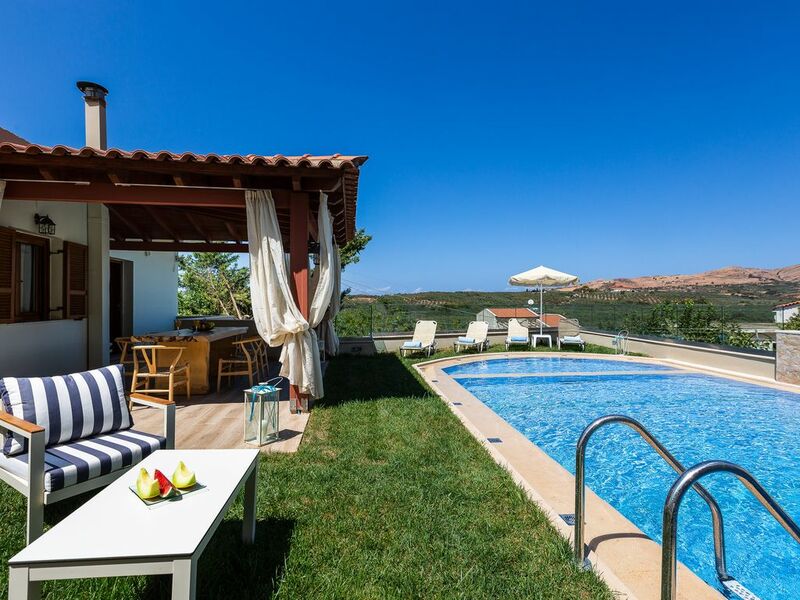 This beautifully appointed Villa boasts breathtaking country side views, overviewing vast olive groves, small hills and of course the clear blue Cretan sky! Kampos Villa III is set in 120m2 outdoor area and provides comfortable accommodation for up to 7 people. Its design is a modern take on minimalist lines, characterised by spacious areas, that you will just love! The outdoor area of Kampos Villa III, could only be described as a summer fantasy! To start with, there is a sunbathing terrace, featuring a 10x5 private heated swimming pool with a 10 m2 children’s compartment, a lawn covered area, equipped with sun beds, umbrellas and an outdoor shower, where you can relax and enjoy the sun and fresh country side air all day long! It also features an outdoor sitting area and a shaded outdoor dining area with pergola. Last but not least, you will find stone built BBQ facilities with an extra sink, for doing the cleaning up, after enjoying your homemade meals and al fresco dining! Entering the Villa you will find the a beautiful designed dining area, and a lovely living room, featuring an open fireplace! A 42’’ smart satellite TV, a DVD player and a playstation console (available upon request) are there to welcome you in order for you to spend some quality time with your family and friends! Double doors open out onto a large veranda with wonderful views of the landscape! Next to the dining area, lies the fully-equipped kitchen, with a smaller wooden dining table! Featuring three bedrooms, all located in the ground floor, Kampos Villa III can comfortable accommodate up to 7 guests! One of the bedrooms features two single beds, while the other features a double bed, beautifully decorated with style & care and direct access to the pool terrace. The last bedroom boasts one single bed and promises a blissful night’s sleep! All of the the bedrooms are air-conditioned and equipped with flat-screen TVs. The mattresses are very comfortable, in order for the guests to enjoy a good night's sleep! Last but not least, a family bathroom with bathtub is there to welcome you! After a long day of exploration, a relaxing shower is a necessity and a pleasure to be reckoned with! Our guests will also have the chance to explore the surrounding area by riding the two bikes provided and admire the beautiful countryside! Furthermore, the owners of the Villa own a regional tavern, where you can enjoy your breakfast, homemade meals, coffee and ice creams at any time, as it’s just 50 meters away from the Villas! To make things even better, there is also a playground area available in the outdoor area, with children’s toys where our younger guests will love to spend their time. A ping pong table is also there to welcome you, so as for the parents to enjoy a carefree holiday! *The Villa is also suitable for guests with special needs (wheelchair accessible), as it is a ground floor Villa. - Traditional breakfast can also be arranged on request, with an extra charge of 8€/person. - Quality towels, pool towels, linens, covers and blankets provided. A Playstation game console is available upon request. - Secure parking space in the Villas premises. All in-house electronics are available, including a smart TV with satellite reception, dishwasher, large fridge with freezer, electric stove, kettle, toaster, microwave, french coffee maker, espresso coffee machine, washing machine, hair dryer, iron and iron board . A first aid kit, a safety box and fire extinguishers are also provided. -One meal is provided by the owners during your stay! -The pool can be heated March-May, October-November and the days with outside temperature less than 25 °C. -24h prior notice, before arrival, is needed for the pool to reach 23 °C. The cost is 50€ for the first day. -For every additional day of use the charge of heating the pool is 25€.Prior notice is required. -Water temperature can reach up to 26 °C, depending on the outdoor temperature. -In case of rain there won’t be a possibility to use the pool. My name is Valia Kokkinou and Ι am a property manager, graduate of Glion Hotel Management School. I feel very fortunate to have joined some of the worlds most luxurious hospitality brands, such as, Leading Hotels of the World and after many years of studies and traveling around the world, to return to my birthplace, the wonderful town of Rethymno. I have recently created a brand new company, Think Villa, based in 97 Gerakari str, P.C. :74100, Rethymno, Crete, Greece, whose main concept focuses on an authentic form of tourism. Here, me and my colleagues offer a hearty welcoming to all those who wish to escape the city life and have a chance to live locally. We are always at your disposal, in order to provide personalised and professional services to all our guests! The combination of our passion for our work, our devotion, our wish and will to offer you a great holiday experience and our local expertise background, guarantee that your trip will be as dreamed and planned, leaving you with nothing but memorable moments and pleasant feelings! Your hosts and me personally, will take care of all the details of your holiday 7 days per week responsible for your day to day needs – from special dietary requirements to making recommendations and reservations! Prior to your arrival, I will get in touch with you to arrange all details regarding your stay! Your flight details and telephone number would be very much appreciated, in case I need to contact you! Also, please let me know if you have any special requests! At your arrival day, your hosts will be waiting for you, in order to welcome you and give you all the relevant information about the villa and the area! It goes without saying that I will be on the other end of the line if you need any further information or assistance during your stay! Don’t hesitate to contact me for additional information or if there is anything else you may want to ask! Welcome to Crete! Kampos Villa III is a newly built 3 bedroom villa. Among others the villa features amazing country side views, unique design and modern amenities! The Villa boasts a 50m2 private swimming pool, BBQ facilities and a ping-pong table! One bathroom is available in the Villa. After a long day of exploration, a relaxing shower is a necessity and a pleasure to be reckoned with! Bath towels for all guests, shampoo and shower gel are provided. Air conditioning units exist in all bedrooms and the living room area. Air conditioning units exist for heating. Bed linen, pillows, covers and duvets are provided for all guests. Housekeeping, towels and linen changes once per week. There is a washing machine available for your weekly needs. The living room area is complemented by the beautiful open fireplace. The Villa offers shaded, free parking space for 2 cars inside the Villa premises. The Villa offers unlimited, free wi-fi internet access in all areas. Bathroom towels and pool towels for all guests are provided. The villa offers free wi-fi internet access! The living room of the Villa is spacious and and creates a cosy, family atmosphere. Also, it offers direct access to the pool terrace. A dishwasher with large capacity is available, suitable for your every day needs. A top mount refrigerator with a freezer compartment and large capacity is at your disposal. The oven has multiple functions for all types of cooking or just heating food. A microwave is also provided, great for heating your meal quickly. A variety of programs and heating temperatures is available. A french coffee maker and an espresso machine is available at the kitchen. A toaster and a sandwich maker can be found be in the kitchen for your toasts and sandwiches! Dishes and cooking utensils for all guests are provided in the kitchen. The Villa boasts a fully equipped, totally functional kitchen, providing all necessary appliances for a self-catered holiday. Three different dining areas are available for you to choose from. Kitchen, living room or outdoors! A high chair can also be provided if needed for our young guests! There is a smart, flat screen TV of 42’ in the living room area. The TV has satellite signal reception and you can watch all big international channels. A DVD player is available in the living room, so you can watch all your favourite films. Some games (cards, chess, backgammon, board games) can be found in the Villa. Enjoy! Some toys are provided for our young guests. Also, a ping pong table and a playground can be found outdoors. A Playstation console is available upon request. Lovely garden where you can relax and enjoy the sun and fresh country side air all day long! 2 bicycles are provided, free of charge, so you can wander around in the village. Private boat tours could be arrange with extra charge! Outdoor sitting area and a shaded outdoor dining area with pergola. The pool terrace boasts amazing views of the country side! The outdoor area of the villa is embellished by the 50 m2 private heated swimming pool, equipped with sun beds and umbrellas. There also is a special 10 m2 compartment for kids. Additional Services Upon Request, at extra charge: Babysitting, Private Chef, Massage, Delivery of Personal Shopping, Regional Breakfast, Boat Trips, Car rental, Airport transfer, Yoga private lessons, Personal trainer, Spa treatments, Pastry Cook, Tour guide, Activities and excursions, Additional cleaning and linen changes, Personal Laundry service, Traditional cooked food delivery, Personal driver, Doctor on Call, Security, Organising and planning a special event (wedding, birthday, anniversary, etc.) and anything else that you might think! Kampos Villa III is located in Achlades village, just 60 meters away from a cafe and a lovely taverna that belongs to the owners of the villas. In Perama town, 9 minutes away by car from the Villa, you can find everything that you might need like shops, bakery, grocery store, butcher’s, taverns, cafes, supermarkets, ATM machines, pharmacies, gas stations and post office. Also Panormo, is a friendly sea side village, 9 minutes away by car and well know for its sandy beaches. The two main beaches are Limanaki and Limni. Both of them are sandy with clear blue water and ideal for kids, as they are shallow and well protected from winds. The beaches are organised and equipped with sun beds & umbrellas. Water sports are also available. The harbour beach in front of the village is the port of the area, where the boats tie up, this beach is unorganised. The second main beach is located just 200m west of the village. Similarly to the harbour beach, it’s a sandy beach, well protected by a rocky pier. Even further to the east, there is a small cove with a pebbly beach, ideal for seclusion and snorkelling. The village has all the facilities and amenities one would need : well-stocked mini-markets, post office, pharmacy, a doctor’s office, a butcher's shop, bakery (hot, fresh bread every morning from 9 am), various gift shops and traditional seaside shops at very reasonable prices. Further, there is a good selection of cafes and excellent traditional tavernas, overlooking the harbour and the sea, which offer a warm welcome and a beautiful setting to enjoy some traditional Cretan food, fish as well as international dishes. Panormo has regular bus itineraries every 30 minutes that connects Heraklion and Chania cities. Car rental is essential to explore the nearby villages and unique sandy beach locations!